Copyright: © 2018 Karaderi CC, et al. This is an open access article distributed under the Creative Commons Attribution License, which permits unrestricted use, distribution, and reproduction in any medium, provided the original work is properly cited. Background: Proteases are a group of enzymes that catalyze the cleavage of peptide bonds in proteins found in nature. Microbial protease constitutes one of the most important for industrial aplications. Proteases play a crucial role in numerous pathologic processes as well. KCl is an unnatural salt. The purpose of this study was to examine the effect of this salt on protease production under different agitation and heat conditions. Methods: The effects of KCl (rpm/heat) on the production of a protease, of E. coli, P. aeruginosa and E. faecalis strain, were investigated. The decrease in protease production at 37 °C was also observed in this work that proved that heat plays a major role in enzyme production. Results: The presence of KCl also caused a decrease in protease production in three bacterial species. The use of KCl appears to be a viable alternative when it is necessary to reduce protease activity outside of industrial applications (such as health care). This unique property makes it attractive and useful to be used in health industries. In the future we think that it will contribute to clarification of the matter in this way. Proteases (EC 3.4) are a group of enzymes that hydrolyze bonds present in proteins found in nature. They catalyze the cleavage of peptide bonds by water. -CO-NH- + H2 O -COOH + NH2 . Proteases (4.3.1.1), also included in the main group of hydrolases, which are also known as proteolytic enzymes. Proteases show wide diversity in living groups such as plants, animals and microorganisms. Proteases are enzymes that are widespread in nature. Proteases are very important industrial enzymes, when compared to the other proteases. Proteases are found to be having more applications in various industries such as the recovery of silver from X-ray films, the peptide synthesis in the chemical industry, the protein hydrolysis in the food and food industry, the waste processing plants, the textile industry in cotton and wool processing, the processing of dyestuffs and leather products. Proteases, proteolytic enzymes, are responsible for degradation of dead plants and animal tissues in the aquatic environment. Thus, protease-producing microorganisms are also useful in protecting the ecosystem of the environment. Bacterial proteases among the proteases appear to be more effective when compared to other cell proteases. Microbial proteases representing nearly 40-60% of the world enzyme market [1-6]. Proteases play a crucial role in numerous pathologic processes (as, tumor metastasis, arthritis). Microbial proteases act as virulence factors in many diseases (resulting in the disintegration of proteins) where microorganisms are caused. It is known that these enzymes damage the defense proteins of the host organism. Many microorganisms were used to produce protease such as Streptococcus sp., Bacillus sp., Streptobacillus sp., P. aeruginosa, E. coli [7-11]. It is known that proteases possessed by P. aeruginosa infections are an important factor particularly in the invasion and proliferation (like inflammation) of tissues . the kinds of proteases include protease IV, alkaline protease, elastase, LasA and LasB. The proteases promote development of the bac­teria within the infected host and interfere with the host immune system . P. aeruginosa produces several extracellular enzymes that are important in its pathogenicity. The proteases promote development of the bac­teria within the infected host and interfere with the host immune system . Escherichia coli is one of the most important pathogens that cause mastitis in dairy cows, it alone contains numerous proteases . KCl is an unnatural salt. The purpose of this study was to examine the effect of this salt on protease production from E. coli, P. aeruginosa and E. faecalis under different agitation and heat conditions. Bactopepton, Yeast Extract (Mast Diagnostics); NaCl (Merck), Agar, Caseine, Folin, TCA (Sigma), Na2CO3 (Riedel-de Haen), KCl (Carlo Erba) were used in the study. E. coli ATCC 20715, P. aeruginosa ATCC 27853 and E. faecalis ATCC 25539 obtained from ATCC (USA) and used in this study. Strains of E. coli, P. aeruginosa and E. faecalis were routinely maintained on Luria-Bertani (LB) agar Petri plates. LB medium (gL-1; Bactopepton 10, NaCl 10, Yeast extract 5 and 1,5% Agar Petri dish) are used in this study. E. coli, P. aeruginosa and E. faecalis were cultivated routinely at 30 - 37 °C on Luria-Bertani medium O/N and static, 100 rpm or 200 rpm shaker, respectively. Growth of the bacterial culture was determined by measuring the optical density at 600 nm in a UV/VIS spectrophotometer. All (and control) tubes was setting OD600 of 0,3 - 0,4 optical density value. The optical density value of the bacterial cultures was found to increase from 0,5 and hence they were diluted to an average of 0,3-0,4. A 100 µl culture of bacteria were inoculated into LB medium 10 ml/100 ml Erlenmeayer flasks at 30 - 37 °C, static, 100 rpm or 200 rpm shaker and 100 mM KCl, respectively. Protease activity was determined using a modified method [4,6,14,15] with casein as the substrate. It was incubated at 37 °C for 24 hours. After incubation, the culture medium was centrifuged at 14000 rpm at 20 min room temperature and the supernatant was used as an enzyme source. However, 1% casein -in 0.1 M phosphate buffer and pH 7.0- was used as substrate. 250 µl casein and 50 µl enzyme supernant was added and incubated at 37 °C for 15 min. The enzyme substrate reaction was terminated by adding 250 µl of Trichloroacetic acid (TCA). Tube contents added to a new Ependorf tubes were centrifuged at 14000 rpm for 20 min at room temperature. From this, 250 µl of supernatant was taken, to this 750 µl of 0.5 M Na2CO3was added, mixed well and kept at 37 °C for 15 min shaken. It was added with 250 µl of folin phenol reagent (1/4 ratio) and kept at 37 °C for 30 min shaken. The absorbance was read at 660 nm using Spectrophotometer [4,6,14,15]. “The amount of protease produced was estimated and expressed in µg of tyrosine released under standard assay conditions. Based on the tyrosine released the protease activity was expressed in microgram of tyrosine released by 1 ml of enzyme in 30 minutes at 37 °C on tyrosine equivalent” [4,6,14,15]. ε= (ΔA° / min) / 0, 6896 (This formula is used in calculation) . The highest and lowest protease production was shown by reading the absorbance of the cultures in the protease production at OD660. Each value is the average of at least three independent experiments. For clarity no error bars given. They are less than 10 % of mean for each data points. The maximum difference was observed in E. faecalis at 200 rpm with a difference of at least 6.2 fold at 0 rpm and in P. aeruginasa (Figure 1). In this study; the highest protease production in the 30 °C static environment was found to be 0,6801 U/ml in P. aeruginosa and 0,5727 U/ml in E. coli (Figure 1). In one study, P. aeruginosa ATCC 27853 strain and in this study, it was incubated in the “Hammersten casein” solution of 0,6% as a substrate and at 30 °C. As a result, P. aeruginosa ATCC 27853 strain has protease production . Again in this study; the highest protease production in the 30 °C KCl medium was found to be 0,2399 U/ml in E. coli and 0,1063 U/ml in P. aeruginosa (Figure 1). In our study; the highest protease production at 30 °C 100 rpm was found to be 0,8478 U/ml in P. aeruginosa and the lowest value was found to be 0,4862 U/ml in E. coli (Figure 2). Another study included Bacillus cereus and protease activity of Bacillus polymxia bacteria. Cultures were incubated in TSB (Tryptic case Soy Broth) at 30 °C at 100 rpm for 72 hours. As a result of this study, Bacillus cereus 34,72 U/ml and Bacillus polymxia 46,72 U/ml were found . Protease production 30 °C 100 rpm the highest value in the KCl medium was 0,3735 U/ml in E. coli and the lowest value was 0,2504 U/ml in E. faecalis (Figure 2). In this study; protease production the highest at 30 °C at 200 rpm, 0,9709 U / ml in P. aeruginosa and 0,5858 U/ml in E. coli (Figure 3). No other study similar to this study was found in the literature. In our work; protease production was found to be 0,8635 U/ml at the highest E. faecalis and 0,1247 U/ml at the lowest E. coli (Figure 3). In the literature similar studies related to these studies have not been found. 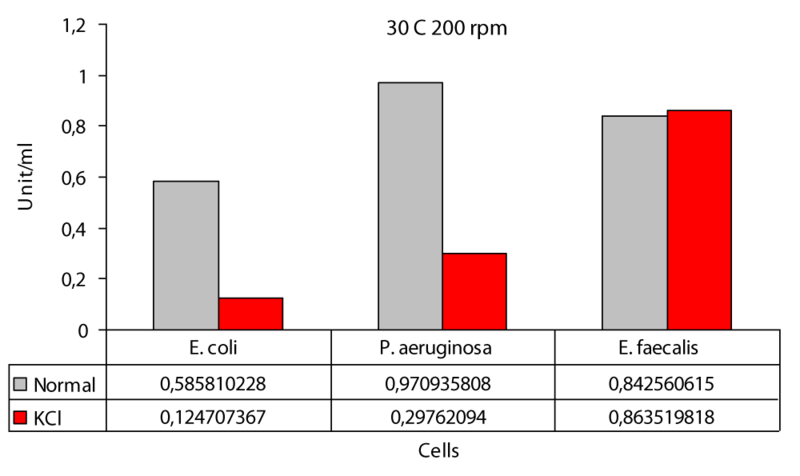 The highest protease production was at 0.97 (U/ml) at 200 rpm and in P. aeruginosa (Figure 3); at least protease production was achieved with 0.49 (U/ml) at 100 rpm in E. coli (Figure 2). 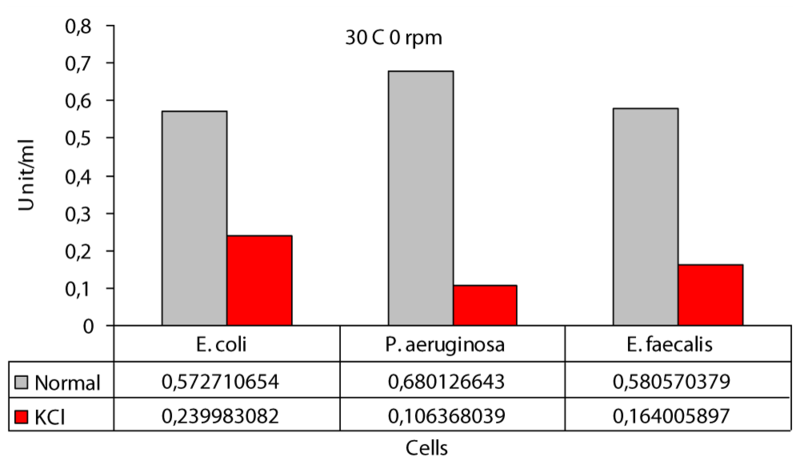 The highest protease production in the presence of KCl was in E. faecalis with 0.86 (U/ml) at 200 rpm (Figure 3); while the lowest protease production was in P. aeruginasa at 0,11 (U/ml) to 0 rpm (Figure 1). While KCl showed the greatest effect on P. aeruginosa, it showed the least effect on E. faecalis. The presence of KCl also caused a decrease in protease production in three bacterial species. Figure 1: Protease levels of P. aeruginosa, E. coli and E. faecalis, grown in LB medium 0 rpm agitation conditions at 30 °C normal (○) and 100 mM KCl (●), respectively. Figure 2: Protease levels of P. aeruginosa, E. coli and E. faecalis, grown in LB medium under 100 rpm agitation conditions at 30 °C normal (○) and 100 mM KCl (●), respectively. Figure 3: Protease levels of P. aeruginosa, E. coli and E. faecalis, grown in LB medium under 200 rpm agitation conditions at 30 °C normal (○) and 100 mM KCl (●), respectively. 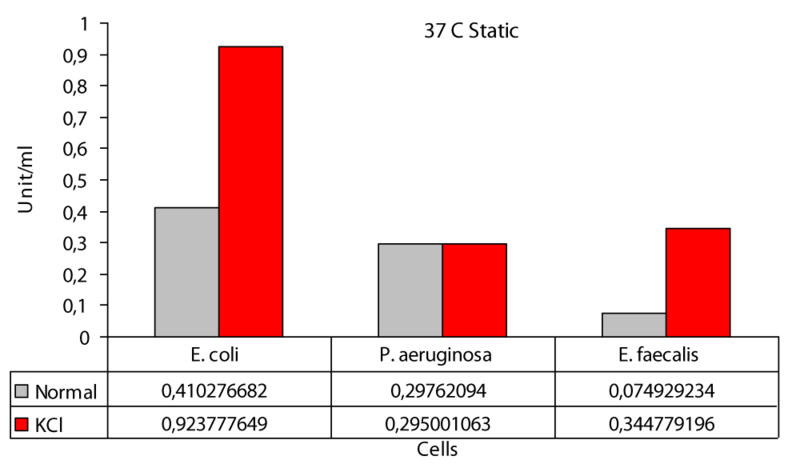 In this study; the highest protease production in 37 °C static medium was found to be 0,4102 U/ml in E. coli and 0,0749 U/ml in E. faecalis (Figure 4). In a different study, a study was conducted on protease activity of P. aeruginosa isolated from patients. The investigated proteolytic activity using “skim milk agar” and observed alkaline protease production using “Casein Broth”. Bacteria were produced at 37 °C. The highest enzyme activity was reported as 133,4 U/ml after 54 hours . The highest protease production in 37 °C KCl was found to be 0,9237 U/ml in E. coli and 0,2950 U/ml in P. aeruginosa (Figure 4). In this study; protease production the highest at 37 °C at 100 rpm, 0,4390 U/ml at E. faecalis and 0,2504 U/ml at P. aeruginosa (Figure 5). In one study, a study was conducted on the production of B. licheniformis protease. In this study, cultures were incubated at 37 °C at 140 rpm for 72 hours in an environment containing soy flour, glucose, CaCl2, MgCl2. They used 5% TCA and 1% casein in the production of protease. At the end of this study, the highest value was 176,7 U/ml . Figure 4: Protease levels of P. aeruginosa, E. coli and E. faecalis, grown in LB medium under 0 rpm agitation conditions at 37 °C normal (○) and 100 mM KCl (●), respectively. Figure 5: Protease levels of P. aeruginosa, E. coli and E. faecalis, grown in LB medium under 100 rpm agitation conditions at 37 °C normal (○) and 100 mM KCl (●), respectively. 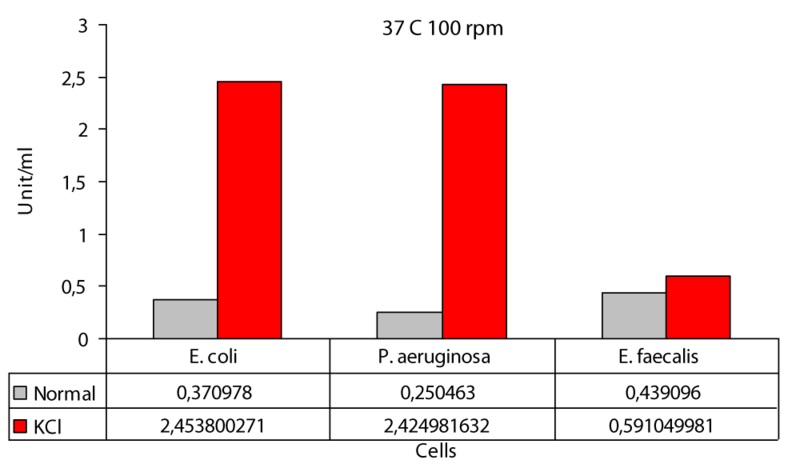 37 °C 100 rpm the highest value in the presence of KCl was found to be 2,4538 U/ml in E. coli and 0,5910 U/ml in E. faecalis (Figure 5). In this study; protease production the highest at 37 °C at 200 rpm and 0,3500 U/ml at P. aeruginosa and lowest at 0,1666 U/ml in E. faecalis (Figure 6). In this study, cultures were obtained at 37 °C 200 rpm for 24 hours in an environment containing glucose, peptone, and salt solution. The specific protease production in the ammonium sulphate-containing medium was found to be 10.32 U/ml . In this study; protease activity 37 °C 200 rpm the highest value in the KCl medium was found to be 0,2373 U/ml in E. faecalis and 0,1299 U/ml in E. coli (Figure 6). Protease activity is increased in the presence of KCl at both 0 rpm and 100 rpm at 37 °C, but not at 200 rpm. The increase is only slightly different from E. faecalis. The reason for this difference was not understood. 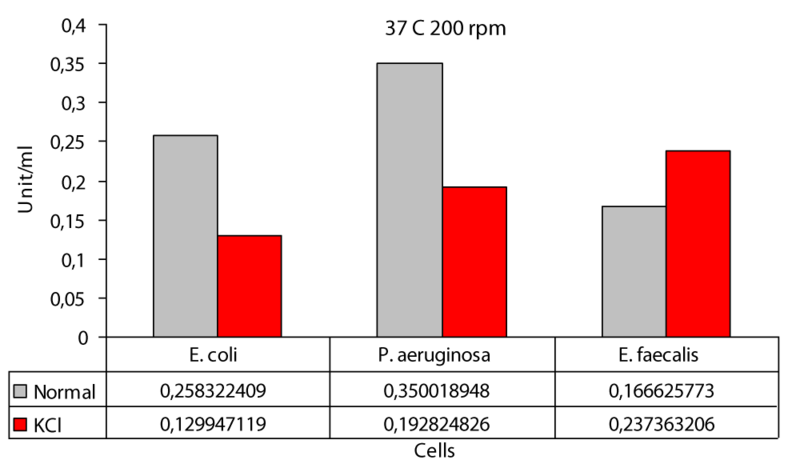 The highest difference during the entire study was obtained in P. aeruginosa at operating conditions of 100 rpm at 37 °C with 9.7 fold (Figure 5). Likewise the lowest difference was again obtained at 37 °C at 0 rpm in P. aeruginosa. It did not matter. While KCl showed the greatest effect on P. aeruginosa, it showed the least effect on E. faecalis The highest protease production was at 0,44 (U/ml) at 100 rpm and in E. faecalis (Figure 5); at least protease production was achieved with 0.07 (U/ml) at 0 rpm in E. faecalis (Figure 5). 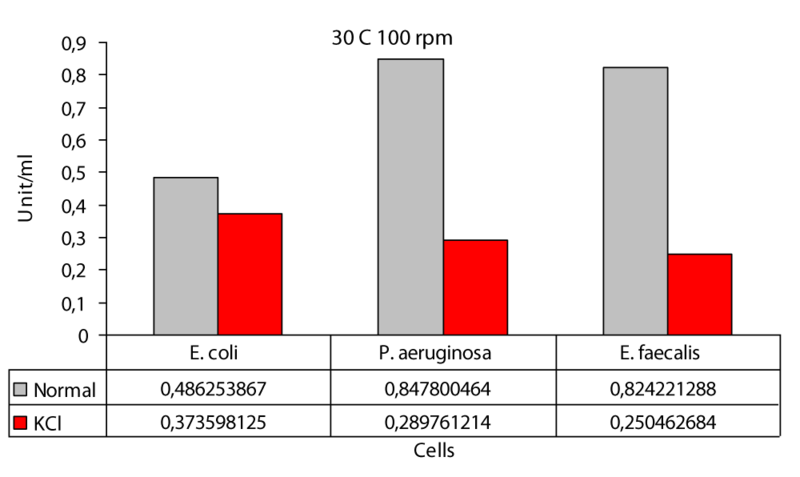 The highest protease production in the presence of KCl was in E. coli with 2,45 (U/ml) at 100 rpm (Figure 5); while the lowest protease production was in E.coli at 0,13 (U/ml) to 200 rpm (Figure 6). The decrease in protease production beyond 37 °C reported by these researchers and also observed in this work proved that temperature plays a major role in enzyme production . Figure 6: Protease levels of P. aeruginosa, E. coli and E. faecalis, grown in LB medium under 200 rpm agitation conditions at 37 °C normal (○) and 100 mM KCl (●), respectively. In this study the indicated that the presence of KCl, E. faecalis was not significantly affected on the negative side. On the contrary, it affects more positively, leading to an increase in protease activity. It has been observed that the presence of KCl reduces protease production in P. aeruginosa and E. coli. The maximum protease activity in productive culture mediums 37 °C and with 100 rpm was measured at E. coli and P. aeruginosa (2,45 and 2,42 Uml-1), respectively. Because of the highest activity was found at 100 rpm. Differences in E. coli at 30 °C it was 2,4 - 1,3 - 4,9 while at 37 °C it was 2,2 - 6,6 - 2,0 respectively. Differences in P. aeruginosa at 30 °C it was 6,2 - 2,9 - 3,2 while at 37 °C it was 1 - 9,7 - 1,8, respectively. Differences in E. faecalis at 30 °C it was 3,6 - 3,3 - 1 while at 37 °C it was 4,9 - 1,3 - 1,4, respectively. The use of KCl appears to be a viable alternative when it is necessary to reduce protease activity outside of industrial applications (such as health care). However, in our studies, especially E. faecalis, protease activity was increased. This unique property makes it attractive and useful to be used in a health industries.In the future we think that it will contribute to clarification of the matter in this way. This work was supported by a Grant (APYB 2015/23) from Research Fund Unit of Inonu University. Kıran ÖE, Çömlekçioğlu U, Dostbil N. Some microbial enzymes and usage fields in industry. KSU J Sci Eng. 2006; 9: 12-19. Smita GS, Ray P, Mohapatra S. Quantification and optimisation of bacterial isolates for production of alkaline protease. Asi J Exp Biol Sci. 2012; 3: 180-186.